Stained glass window from the Church of St. John the Baptist, Wuchzenhofen, Germany. Our "Virtual Sunday Church" takes us this week to the Monastery of the Holy Spirit in Conyers, Georgia (USA). 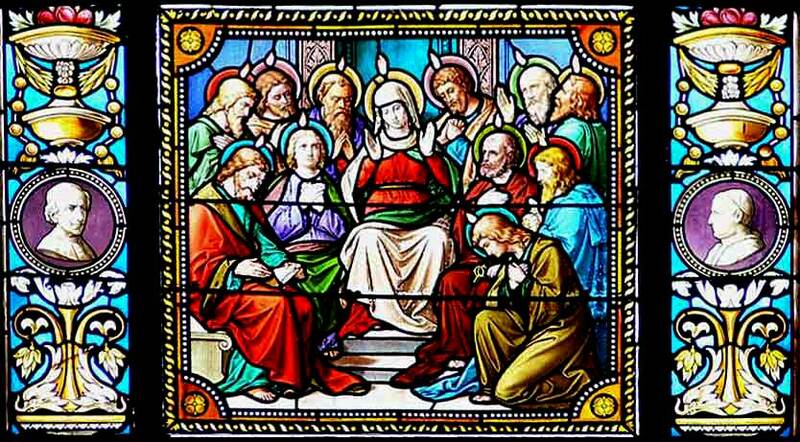 When the Day of Pentecost had fully come, they were all together in one place. And suddenly there came a sound from heaven, as of a rushing mighty wind, and it filled the whole house where they were sitting. Then there appeared to them divided tongues, as of fire, and one sat upon each of them. And there were dwelling in Jerusalem Jews, devout men, from every nation under heaven. And when this sound occurred, the multitude came together, and were confused, because everyone heard them speak in his own language. Then they were all amazed and marveled, saying to one another, "Look, are not all these who speak Galileans? And how is it that we hear, each in our own language in which we were born? Parthians and Medes and Elamites, those dwelling in Mesopotamia, Judea and Cappadocia, Pontus and Asia, Phrygia and Pamphylia, Egypt and the parts of Libya adjoining Cyrene, visitors from Rome, both Jews and proselytes, Cretans and Arabs — we hear them speaking in our own tongues the wonderful works of God." So they were all amazed and perplexed, saying to one another, "Whatever could this mean?" Others mocking said, "They are full of new wine." The Holy Spirit, which Christ had promised would come to keep the apostles company after He had departed, does not come quietly. Rather, it makes a holy spectacle, full of noise and color. The deafening wind and the weird glowing lights that sit atop each apostle's head are dazzling, but the really sensational event is still to come: the apostles begin speaking in odd languages. People from all over the world hear God praised in their native language. We are not sure whether the apostles were actually speaking foreign languages, or whether the Spirit was speaking in such a way that every person could understand as if hearing his native language, but that is not the great miracle. The really important aspect, the true miracle, is that the Word of God is heard by people from all over the known world, not just by Jews. The practice of speaking in tongues has fallen into disfavor in most mainstream churches, although pentecostal and charismatic movements believe in it. Whether or not we believe this miracle is recreated today, however, the true miracle occurs every day; for the good news of Christ, the Word of God, has spread to every corner of the earth. Starting with a tiny band of working-class Jews in Jerusalem, worship of Christ has expanded into every continent and every country. Christianity is the most widely practiced religion on earth. There were doubters, and there would continue to be doubters. One often hears atheists or agnostics saying, "Show me proof and I will believe." But they are kidding themselves. We know that even such a miracle as was seen in Jerusalem almost 2000 years ago could not convince doubters. They make excuses. They will invent reasons not to believe. God has made His miracles available to everyone who has witnessed a sunrise. Helen Keller, who was blind and deaf, could discern the miracle of life. People who do not want to believe will not believe. To those who are willing to learn, the Holy Spirit will come to them, and knowledge of the grace of Christ will be with them their entire lives. The Pentecost by El Greco, c. 1600.